Eat out for a good cause as part of this fall's Dining for Farmers series to benefit the Farm & Garden's apprenticeship training programs. As part of the Farm & Garden’s 50th Anniversary celebration, seven of Santa Cruz County's best restaurants are participating in the "Dining for Farmers" dinner series, donating a portion of their proceeds to apprenticeship training programs. The dinners begin August 23 at Ristorante Avanti and run through October 11 at Shadowbrook. Other participants include Gabriella Café, La Posta, Soif, Ella's at the Airport, and Assembly. 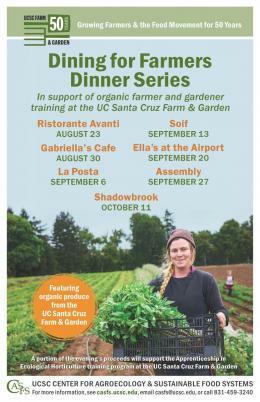 Each restaurant will feature organic produce from the UC Santa Cruz Farm & Garden. Make your reservations now, as participating restaurants will be open to the public and offering their regular meal service on these dates. "Dining for Farmers" supports five decades of leadership in the training of organic farmers and gardeners. More than 1,500 people have graduated from the Apprenticeship in Ecological Horticulture, and hundreds of undergraduates have taken advantage of the hands-on learning opportunities available through the Center for Agroecology and Sustainable Food Systems. The Center's research and policy efforts have helped transform the food system, introducing more environmentally sustainable production methods and pushing for greater economic justice for workers. Center affiliates are also helping campuses across the state adopt more environmentally and socially just practices: buying more local, sustainable, organic food and supporting UC students who face food insecurity with food pantries, dining hall programs, and enrollment in the CalFresh program.